Itamar is a small, close knit Jewish community in Samaria. 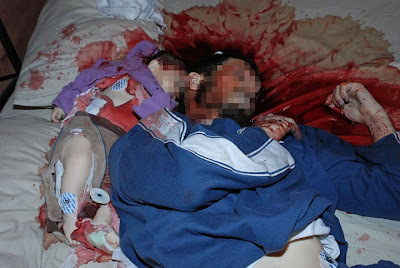 Today, it became a scene of horror, as Arab terrorists infiltrated it, broke into a home and massacred the Fogel family. May a Righteous G-d avenge their blood. Here's what occurred, based on what I'm hearing form my sources. On Friday night around 10:30 PM,during the Jewish Sabbath, the terrorists cut through the fence and entered the house through the living room picture window. They didn't notice the 6-year-old boy sleeping on the couch and continued on to the bedroom where they cut the throats of the father, Udi, 36 and newborn baby girl Hadas, 3 months, who were sleeping there together. The mother, Ruth, age 35 came out of the bathroom and was stabbed there multiple times, on the threshold. Forensic evidence indicates that she tried to fight for her life. 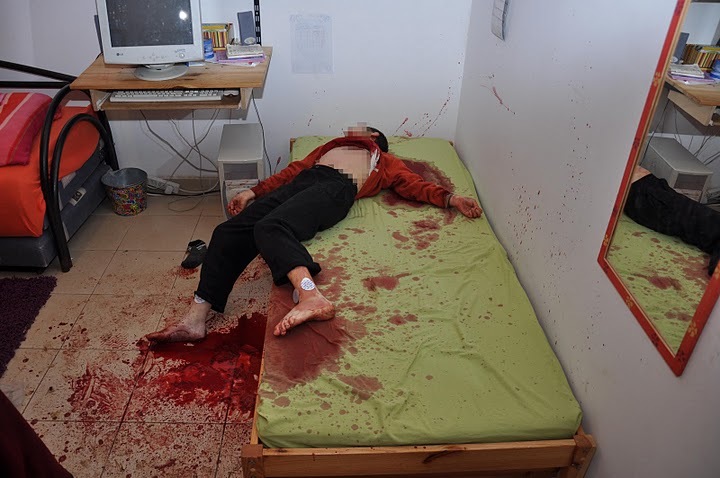 The Arabs then proceeded into another bedroom, and slit the throat of the 11-year old-son Yoav who was reading in bed. 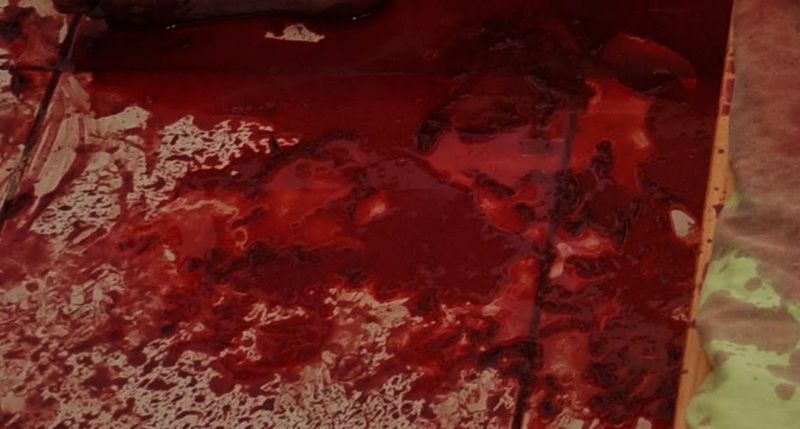 They did not see the 2-year old asleep in his bed, but murdered the 3-year old Elad with two stabs to his heart. After that, they locked the door, exited through the window and escaped. The Fogels' 12-year-old daughter, Tamar who was visiting a neighbor returned home an hour or so later and found the door locked. She asked a neighbor, Rabbi Yaakov Cohen, of the Itamar Yeshiva, to help her. The Rabbi noticed tracks and mud near the house, so he came armed. The two woke up the 6-year old sleeping in the living room by calling through the window and when he opened the door, the Rabbi returned to his home. When she entered the bedrooms, the young daughter saw what had happened to her family and ran out of the house screaming, after which the Rabbi ran back and fired several shots in the air to alert Itamar's security. Within a short time, the police and IDF forces arrived and began searching for the killers. 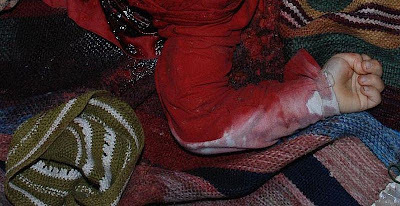 At 03:30 AM, military trackers discovered footprints leading to the Arab village of Avrata. Magen David Adom ambulance service teams were promptly called in, but could do nothing. MDA spokesman Zaki Heller said the ambulance service got the call around 1 AM. “When rescue forces entered the house they encountered a very difficult sight...There were five people there who were hurt. We could do nothing but pronounce them dead,” he said. Paramedic Kabaha Muayua was among the first responders at the site and described the horrific scene he encountered. I thought about this for a long time, but I decided to post these photos, even though they're quite graphic. They were released with the permission of the family, who had the courage to allow this so that so you can see exactly what was done to the Fogels and what sort of enemies we are up against.They could be your family. In the aftermath, residents in Gaza celebrated this latest 'operation' in typical fashion handing out candy to passerbys, honking their automobile horns, firing guns in the air and ululating. According to another source, it wasn't Hamas at all, but a unit of the Al-Aksa Martyr's brigade, who are on Fatah's payroll. In the end, it hardly matters who actually committed the murders. 'Palestinian' unelected Prime Minister Selim Fayyad said "...we categorically oppose violence and terror, regardless of the identity of the victims or the perpetrators." That, of course, was his way of equating the IDF with the murderers of the Fogel family. And the White House essentially said almost the same thing: "There is no possible justification for the killing of parents and children in their home. We call on the Palestinian Authority to unequivocally condemn this terrorist attack." Needless to say, when the 'Palestinians' give honorary citizenship to child murderers and make them national heroes, 'condemnation' is pretty meaningless, especially in English. You might also recall that the last the time 'Palestinian Authority' arrested terrorist murders, they freed them after keeping them in 'jail' for four months. Shomron Regional Council Head Gershon Mesika blamed Defense Minister Ehud Barak for removing check points in the areas between the Palestinian Authority in Shechem (Nablus) and the Jewish communities in the area. I agree with him. "We need to find those behind the attack and give them the death penalty. I can't recall such a horrific terror attack," he said. National Infrastructures Minister Uzi Landau said that 'Palestinian Authority' President Mahmoud Abbas was responsible for the terrorist attack in Itamar because he continued to allow incitement against Jews and Israel in the schools, mosques and media. Any other country would have broken off all relations with the 'Palestinians' long ago. Netanyahu is going to have to make a decision. What comes first, protecting the people and the land of Israel or shuffling to President Obama's fiddle? I appreciate his position, but the time for dancing on cracks is over. And if he continues to do it, the Jewish residents of Judea and Samaria are going to take matters into their own hands, that I guarantee you. With evil this direct, this implacable, one cannot compromise or negotiate. Melanie Phillips has more, here. "In the end, it hardly matters who actually committed the murders." I disagree on this point because the killers are connected to "Moderate" Abbas. No matter how many times this happens, it appears Abbas will be considered moderate by the biased Western media, the UN, etc. But the veil has been lifted again. I also support posting the photos. I posted them on my Facebook page. Complete silence. No comments. This is because most of my "Friends" are liberal, including the Jews. No one commented, "This is horrible." But they are making such comments about the tragedy in Japan. By 'it hardly matters', I meant to show that there is little difference between Hamas and Fatah when it comes to Jews and Israel. I'm glad you posted the photos. I wrestled with myself over it, but decided that showing the Left exactly what 'peace' with the Arabs really means was important. I'm glad you posted these pictures. They are horrible but they really do show the full extent of the cruelty we are facing with here in Israel. There cannot be peace with them as long as they are so deadpan on their intent to annihilate us all. I'm sure not all Arabs would slit a 4 month old's throat, regardless it's nationality, but the scum who did this surely did it because of all the deception and lies that the government is teaching its children. May the family know no more sorrow and may the deceased rest in peace. Its good that these photos are being shown here. Unfortunately they will not be shown on the main stream news media. It does not fit the image of Arabs being persecuted by the big bad Israelis. As such, it would never make the main stream media. We are regularly treated to images of dead Arabs at the hands of America or Israel but never the opposite of that. If nothing else, showing these kinds of images by the main stream media would present the users of information, the public, with a clearer picture of what is going on. Unfortunately the media is not interested in providing a clear picture of any thing. They are only interested in an agenda. This agenda could be best summed up as "America bad, Israel bad, Arabs good, enemies of Aemrica good and noble, enemies of Israel good and nobel, anyone who would cooperate with America or Israel bad." This family is in my prayers. May the killers be brought to justice. May Israel's enemies be defeated. May America's enemies be defeated. for every one photo you got, the palestinians can provide you 1000+. your so called state of israel is a brutal occupier without recognized boarders. what goes around, comes around. quit your settlement and return to europe or wherever you came from. In the above brief para, you showed us a number of things - why creating a second 'Palestinian' state is a dangerous and ridiculous idea, the 'anti-Zionist' idea of moral relativism, adherence to fact and sense of tolerance is, why the entire 'peace' process is an exercise in futility and why a strong Israel is an absolute necessity..because of people like you! Trust me,Anonymous...if the IDF behaved anything like your beloved 'Palestinians', the 'Palestinians' would have been wiped out and ethnically cleansed from the land Israel foolishly gave them via the Oslo Accords a long time ago. Bash your head against the wall until this sinks in. The Jews are home and Israel stays. Support the death penalty against ALL convicted Islamic Terrorists, Israel needs to take em out for good! Semi Moderates and Radical Muslims, same bunch, both support a fakestine, and have in their charters the destruction of the state of Israel, one wears necktie the other one doesn't, but they both carry knives to kill Jews. Enough is enough already! Anonymous? Go screw yourself. Hard. I hate to say this, because this is such a sad and horrible story, but the title of this post is unintentionally hilarious. Now that I've got that out of the way, I have to say I agree with your decision to post the photos. I posted one of them myself. Everybody needs to see this whether they think they do or not. People that post links to the photos with warnings of how gruesome they are are probably insuring a good many people never see them, including those who need to see them the most. You cannot appease terrorists. To behead a 3 month old baby takes some one who considers you weak and will not retaliate. Remember Ronald Reagan and libya -2 jets popped a couple of rockets into Kadaffi's tent and he went into hiding and wearing dresses and giving up his plans for nuclear weapons. Now he is back strong because he knows sissies are in power!! That is such a sad incident and a horrible incident of creulty on a sleeping family. Whether the killer is an arab or a jew, he or they are stone hearted killers and need to be apprehended and executed! My heartest condolence to the girl and the little boy who lost his family in such a horrible horrible crime!! It was just soo sad to see those poor murdered children! This incident was heartbreaking to see and my deepest condolences to this family. It is sad to see the war going on between fanatic and jews with all the natural disasters we are already facing on this earth. The difference is that the Jews build and grow the fanatics break and kill. these fanatics attack jews defend. Jews are successful doctors lawyers, producers, inventors, biggest designers.... and we represent 0.02% of the population. The fanatics occupy 20% of the population they own rich land and want more so they can sit on it. Enough!! learn to love, share and make peace, do it for your children. Are we calling all murderers terrorists now or just the Muslim ones? Since the killers admitted their political motivations and were part of Abbas' faction, why wouldn't we call them terrorists? Although I have a feeling you wouldn't. This is an example of what you get when someone with no morality whatsoever attempts to make a 'point'.